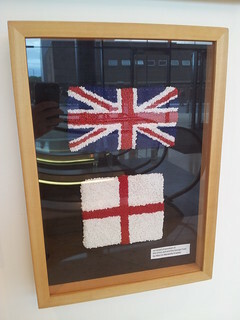 Two Flags (2012), by Miss GG by Katy Stoddard, on Flickr. If Scotland were to become independent, who would I be? […] As a Scots Briton born in New Zealand who happens to live in England-and-Wales (Northern Ireland would presumably depart to join Scotland in due course), why would I think of myself as English, then, any more than, say, European? Mr Lilico seems to be using ‘English’ and ‘Scottish’ as ethnic labels, in the same way as Americans use European ethnonyms to describe their ancestry even if they haven’t left the US for generations. In other words, ‘British’ is used to denote the citizenship, and this can then be further qualified (e.g., ‘Scots British’, ‘English British’, ‘Asian British’ or ‘Black British’). I presume he would not approve of somebody describing themselves as ‘Italian Scottish’ or ‘Pakistani Scottish’. In other words, ‘Scottish’ is now used in Scotland in a similar way to how ‘British’ is used in England (or at least in London), and people do indeed happily describe themselves as ‘Italian Scottish’ or ‘Pakistani Scottish’. The distinction many people from England make between ‘British’ and ‘English’ reminds me of the distinction in Russian between российский and русский (both normally glossed as “Russian”). The word “российский” rossíjskij means belonging to Russia, as a citizen or resident regardless of ethnicity, while the word “русский” rússkij describes ethnic East Slavic Russians only, but not other ethnic groups in Russia. I wonder what England will do once Scotland, Wales and Northern Ireland have all left the UK (as I’m sure will happen once Scotland has taken the first step). Will they still call their country (South) Britain to allow themselves to preserve the distinction between ‘British’ and ‘English’? Or will they need to coin a new word to cover a citizen of England who isn’t ethnically English (e.g., ‘Englandic’)? I don’t think anybody in Scotland feels a great need to introduce the word ‘Scotlandic’ to express this difference. Scotland has always been a country of emigrants and immigrants — a multilingual, multiethnic and multireligious place. A Scot is indeed someone born here, and anyone who has paid us the compliment of settling here. Addendum (12/04/14): Some rather interesting maps have been published by BBC News, which I think confirm what I wrote here.